Finding Molly: An Adventure in Catsitting is a graphic novel about Molly Sanchez-Talebi, anunemployed art school grad who hesitantly starts catsitting to pay the bills. She dreams ofbreaking out of suburbia and her artistic rut, but she has a lot of self-discovery todo before that happens. The comic follows her funny misadventures as she learns that maybe these (sometimes) friendly felines are just what she needs to get her life on track. The kids at school wonder what kind of life the Lunch Lady leads. Soon after the new substitute seems a bit odd, the Lunch Lady begins her work and gets to the bottom of things. She finds out that the odd substitute is a robot, created by the science teacher to get the kids to hate all other teachers for giving them extra robot-ordered homework. Then the science teacher can be Teacher of the Year, or so he thinks. The Lunch Lady and her sidekick figure out that the teacher is a robot and she fights the clan of evil robots away from the kids. All seems well at the lunchroom again until we find that the evil cyborg substitute is at the jail, requesting new orders from the science teacher. Vardell states that, “there needs to be a clear and consistent point of view that encourages the reader to believe in this fantasy world and engage in the ‘willing suspension of disbelief’ for the length of the novel.” This is the power of the Lunch Lady books. These books are great graphic novels that are easy to read, full of unbelievable circumstances, but just such great fun that you don’t mind. It really reminds me of the Captain Underpants series that my middle school students really enjoyed. I agree that there is so much subtle detail in the pictures, the way the graphics are arranged, the little play on words here and there and, the movement of the story. It works so well as a comic book style tale of a superhero. This is just such a nice way to put the situation into a school with fantastical scenes that I think a lot of young readers, male or female, will really enjoy these. I would suggest keeping such graphic novels available in my classroom or school library. 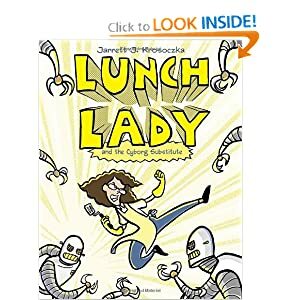 For those who are reluctant readers, this has the basic elements of character, plot, setting, theme and style so any kind of book report or presentation would be done well by using a Lunch Lady book.